Multi-channel audio simply means having more than one audio stream (i.e., channel) at a time. So strictly speaking, stereo audio (which has two channels, and is what all CDs and MP3s are) is multi-channel audio. However, multi-channel audio generally refers to using MORE than two channels at a time. The important idea to remember is that each channel goes to its own speaker (so two channel = two speakers, four channels = four speakers, etc.). Any number of channels is theoretically possible, but in practice is limited to the hardware at hand. Some standard formats exist: Quadraphonic (4 channels going to four speakers, setup in a square or rectangle formation), 5.1 (five channels going to five speakers, setup in a quasi pentagon), 7.1 (seven channels going to seven speakers, setup like 5.1 but with added rear speakers), etc. In 618, we'll be using a Quadraphonic setup. 1) A computer with software capable of multi-channel output. For us, this is the iMac (or your laptop) and Logic Pro. 2) A multi-channel audio interface. For us this is the MOTU 828mrk3 Hybrid (the black box on the left of the iMac). 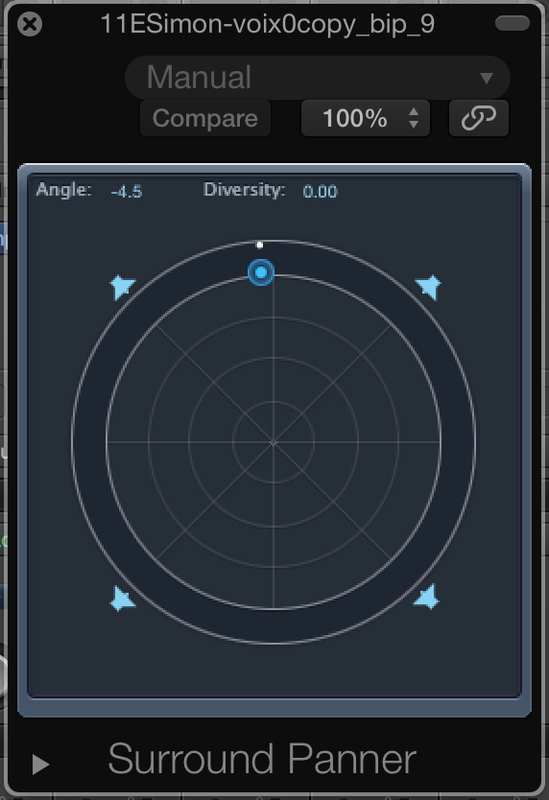 An interface is a device that converts digital signals from the computer, and converts them to electrical signals to be used by mixer and speakers (see "DAC" from your "digitizing audio" class notes). 4) Speakers connected to the outputs of the mixer. For us, these are the two Genelec in front of the desk, and the two other Genelecs sitting on the cabinets at the back of the room. 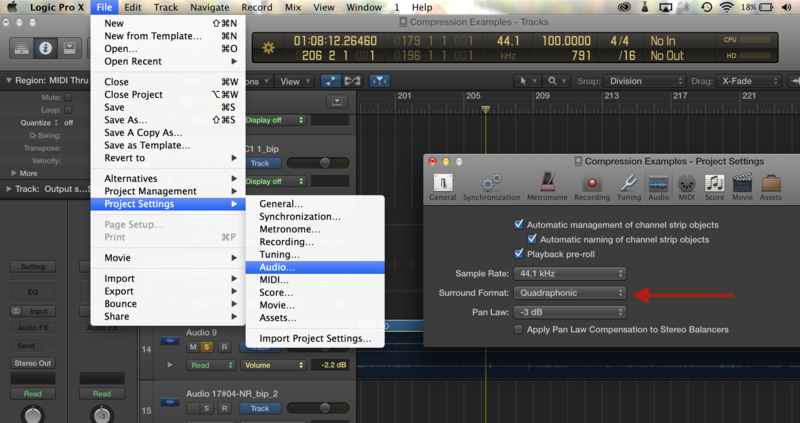 6- Make sure the "L/R" Output Assignments buttons are pressed down on the Mixer. The "L/R" button sends audio to the "Main Mix" fader (labelled "Front Speakers", on the bottom right of the mixer), which in turn sends audio to the "Main Left and Main Right" outputs on the back of the mixer, to which the front two Genelec speakers are connected. 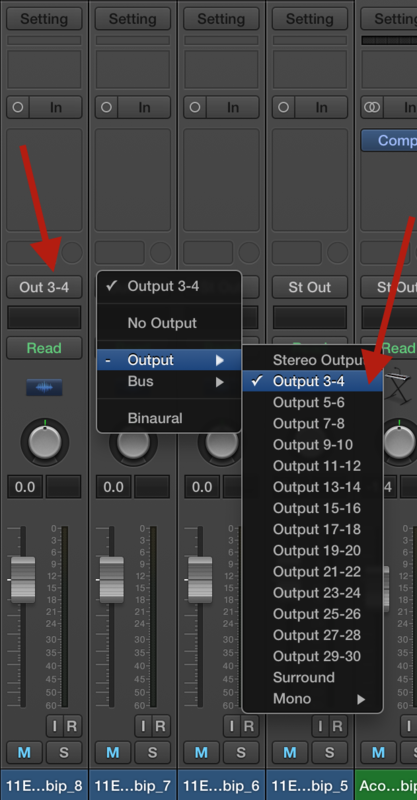 11- Make sure the "3-4" Output Assignments buttons are pressed down on the Mixer. The "3-4" button sends audio to the "Sub 3 and 4" faders (labelled "Back Speakers", on the bottom right of the mixer), which in turn send audio to the "Sub 3 and Sub 4" outputs on the back of the mixer, to which the Back two Mackie speakers are connected. You should now hear something from the Back speakers. 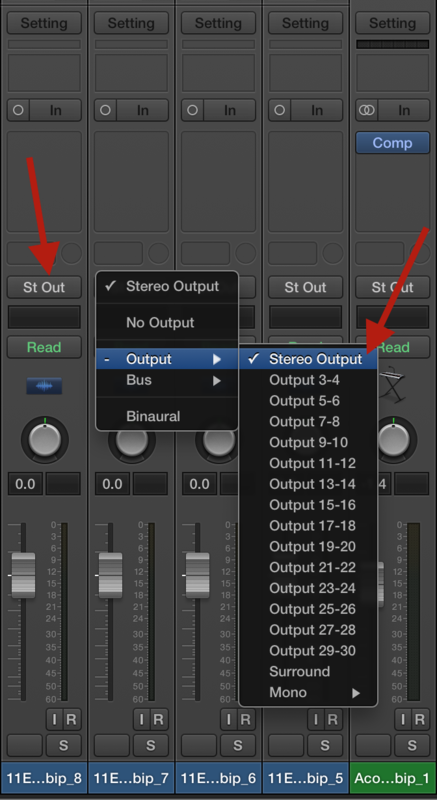 If you don't, repeat steps 1-7, and also make sure the Mutes on strips 3 and 4 of the Mixer are NOT pressed down. 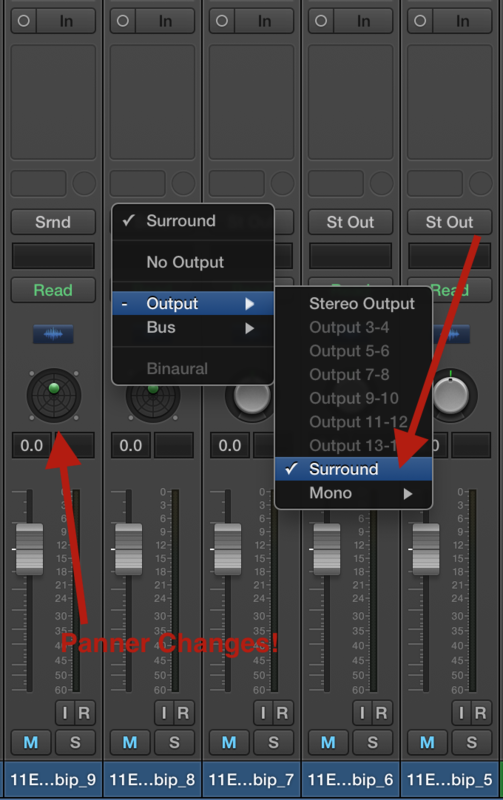 This is the simplest way to send sounds to the rear speakers. 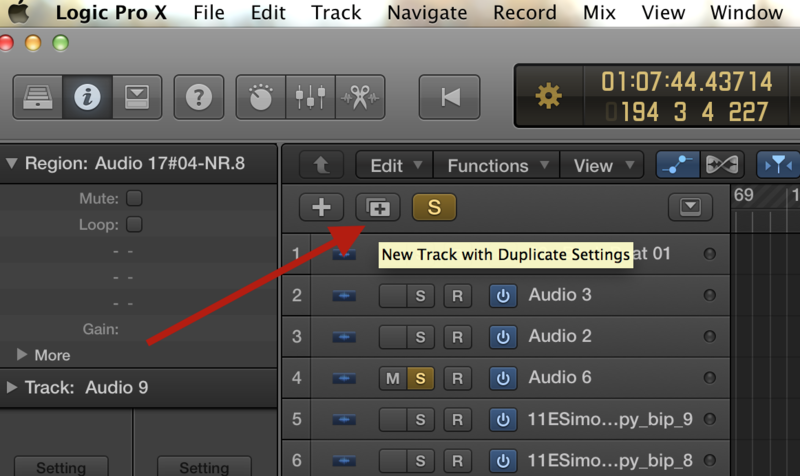 If you want to have one sound go from the front speakers to the rear speakers, then you must duplicate that sound's track (by pressing the "Create New Track with Duplicate Settings" button)….